Hi y'all! I've missed you, it's true! Guess what I did last night? I went to an amazing picnic potluck at Parc Jeanne Mance! I met so many cool new friends and ate lots of delicious food too. People are just oh so talented! Good job everyone! Before heading over to the picnic, my friend and I popped into Viva Granola in search of The Vegg! And we found it! I've been wanting to try this vegan powdery, egg yolk replacement for quite a while now. I just couldn't find it in-store and didn't want to order it online. So I waited patiently. It's meant to taste and feel like egg yolk which is kind of a strange concept to me... but I really like trying new things so I bought a package anyway! Plus, 10% of the proceeds go to Compassion Over Killing, can't go wrong. I bought a 1.56 oz bag for about $9.00. One bag yields 1 L of yolk, the equivalent of 30-40 chicken egg yolks! That's a lot. 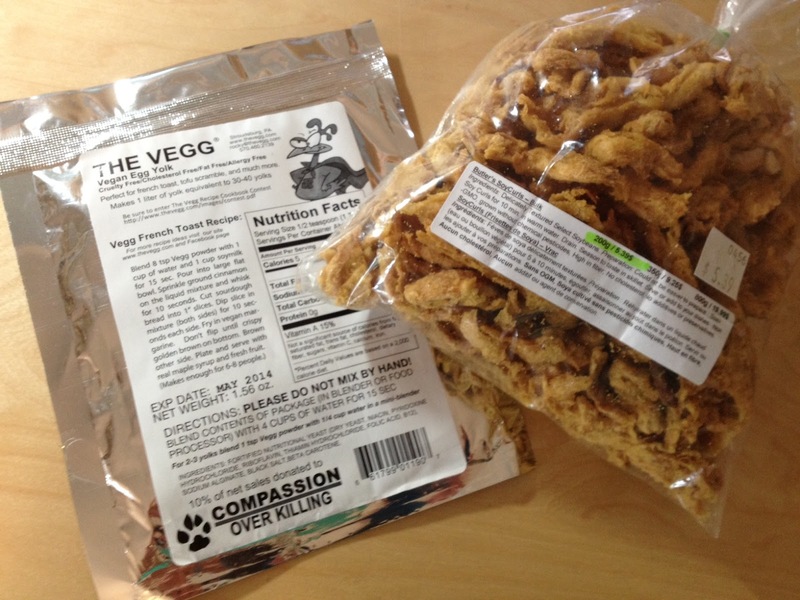 The main ingredients in The Vegg are nutritional yeast and black salt. I regularly use both of those ingredients to make vegan egg salad and tofu scramble, so I'm not really sure how this product will stand apart. I guess I'll let you know once I've tried it out! I'm pretty pumped about it. The product's website has a plethora of interesting recipes that incorporate the vegan egg yolk, such as: french toast, frittatas, custard, homemade pasta and just plain old liquid egg yolk to dip your toast in at brunch.... interesting. Like I said... I'll keep you posted with my results! I also purchased Butler's Soy Curls while at Viva Granola! I'm not a huge TVP product fan, but this brand caught my eye mainly because of their beautiful golden hue and crispy fried-like appearance! Everyone knows I'm a sucker for crispy, fried goodness! I've been pondering what to do with the curls, and I'm probably leaning towards re-hydrating them in some delicious veggie broth, rubbing them with jerk seasoning** and frying them up in peanut oil until CRISP and delicious! So either that, or a variation of this chick'n salad! I'd stuff a couple mini pitas with the salad mixture, add some sprouts and arugula and voila : Yumminess. Does anyone out there have any tried and true recipes or fun suggestions for either The Vegg or the curls? I'd love to hear about them! **like allspice, cloves, nutmeg, cinnamon, garlic, Scotch bonnet peppers, green onions, and salt! I like cooking up the Soy Curls with BBQ sauce, and in stir fry over rice are my favorite. Just rehydrate for about 10 min. in warm water first. oh! bbq sauce sounds delicious!